Also working on some terrain for my gaming table. I think the buildings turned out rather well. Not as keen on the forests but they'll do. That tank looks very good. Did you hand paint the insignia on the front of the tank? They look like decals. Decals from Flames of War. Honestly, painting complex camo schemes and the like in that scale is a futile endevour (IMO). However, with that said, I get it! I'm finishing up a platoon of IV's and I did a typical Normandy (ish) paint scheme. 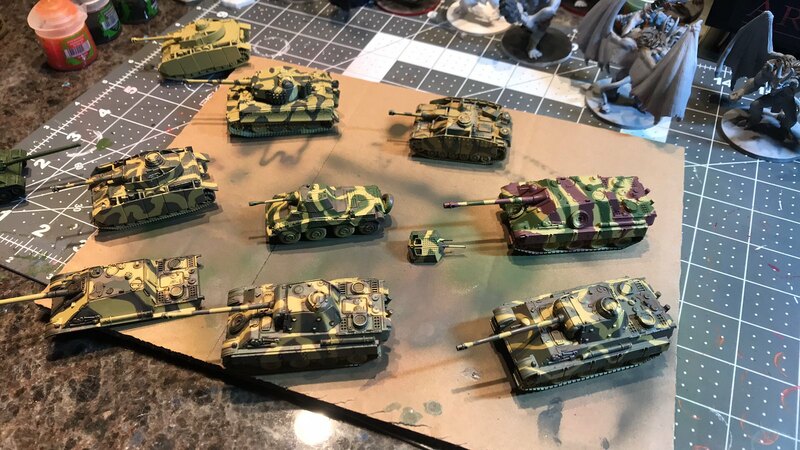 Once I got done with the decals I was ready to weather the tanks. I had a row of pigments and fixture all ready to go. I got up from the table and told myself "I'm going to see a lick of this weathering from a couple feet away"
Still, we want our toys too look great! Your Firefly looks awesome by the way. I'm guessing your getting ready for some post Normandy fun? As for terrain, I'm not a huge fan of making any of it. I've purchased most of my terrain only have to paint some of it. Making my own trees, but what I'm going to do is use a bit of green felt, texture it a bit and use it as a forest outline putting a few trees in it for aesthetics. The thing I dislike the most is painting infantry in 15mm, but again, you aren't going to see the detail work on them from a couple feet away! I think that's my greatest obstacle when it comes to minis painting. As I'm usually viewing them through a magnifying lens from a few inches away, I obsess over fine detail and getting paint coverage in where nobody's even going to see it. The fact that I slipped and got a tiny bit of black past the edge of what I was painting and onto a surface where there shouldn't be any means I end up taking forever to paint each figure. Nobody's going when it's on the gaming table unless they pick it up and do a detailed examination but the fact I know it's there drives me nuts. It also means I end up going with very muted and subtle colours that look nice when very close up but are usually indistinguishable from two feet away. I see some the figures some guys paint with very high contrast shades and highlights and they look amazing from a few feet but very garish when close up. 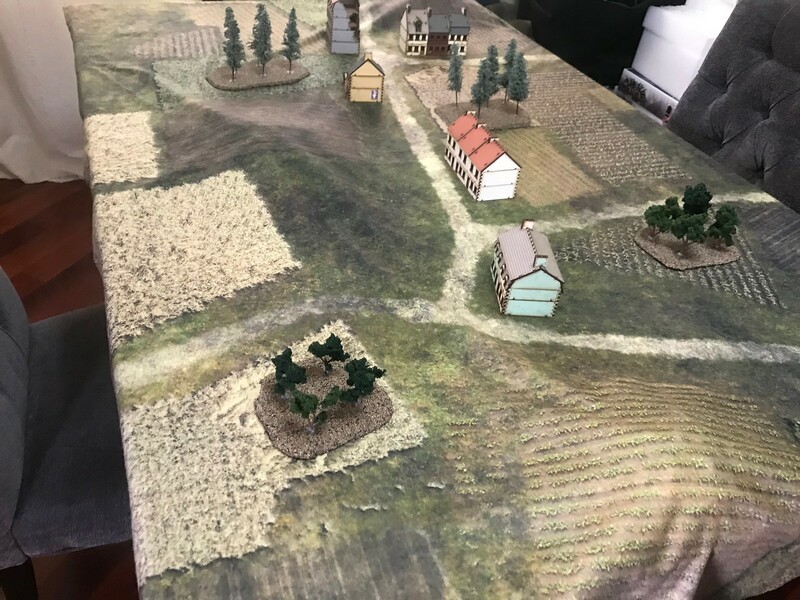 On a gaming table, the contrasts really pop and look fantastic but I can't bring myself to paint like that because when I'm viewing from a few inches away, it looks cartoonish and the layering and glazing looks sloppy in places. Ive almost finished painting the Team Yankee starter set. That woodland camo was a pain in the arse! The M1 on the left was my first airbrush "paint", while the other one was brush painted. I finally bit the bullet and bought an airbrush. 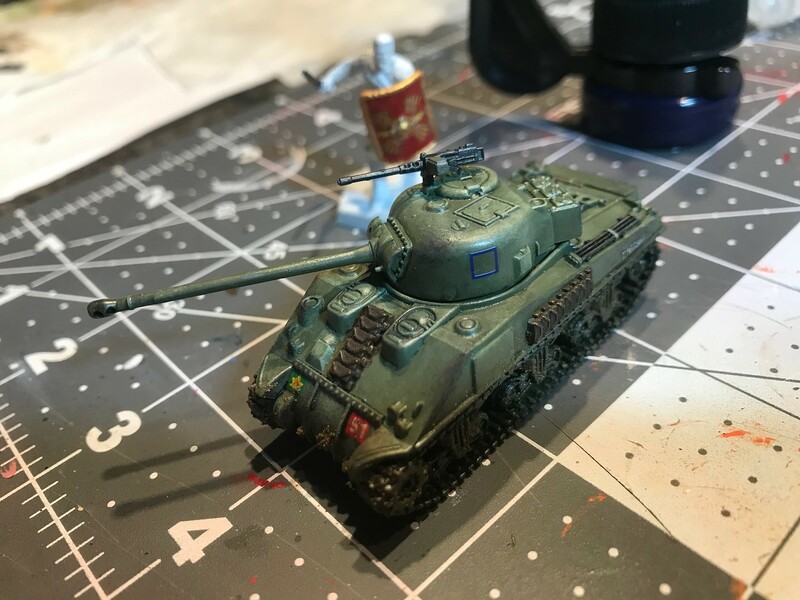 Tried it out for the first time today just to put down the base colour coat on Soviet armour. Man, talk about frustration! Despite watching a tonne of tutorial videos and thinking I had a reasonable handle on things, I had a hell of a time getting the paint/thinner ratio right. Pretty splattery in some cases and plugged up nozzle from overly thick paint in others. Good thing I started on the undersides as they'll get a good coat of grime and mud later to hide my shame. If its one thing thats been a real PITA, its thinning the paint for the airbrush. The airbrushed M1's paint was thinned by rubbing alcohol and seemed to work fine. But when I tried that with the flat green for the Soviet tanks the paint clotted. I finally broke down and bought some Vallejho thinner. And it does work very well but I have to mix it externally and then pour it into the cup. Mixing in the cup is a big fail. Finally had some time to sit down, fiddle with the new airbrush and take a crack at painting the Germans. Just got the base coats down so far but I'm reasonably happy with the results. I did try to free hand the camo to get more of a realistic spraypaint look but I just don't have the control required for that kind of detail work with the airbrush yet. I used silly putty as a mask and just put down layers instead. Looks OK at typical gaming distance but a bit rough up close. Dirtying them up is step 2.